Ever get your issue sorted out? My bike is still at the dealership. They first reset the entire system and the DDC worked for about 5miles and then stopped. So it’s an intermittent problem that BMW has to work with my dealer’s service department to go through the system and see what is happening. It’s such a complicated system and frustrating all the way around. My original post was asking if anyone thinks there is a material difference between the DDC system performance between the 2015/2016 model to the 2017/2018 model. I’ve ridden both and to me, the older version in Sport is much more firm and responsive then Dynamic on the 2017/2018. It’s disappointing. I bought the 2018 after riding my friends 2016 bike. I want the option to be as firm as possible and the older bike seems better. 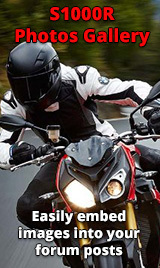 If you want it as firm as possible, also set the bike for carrying a passenger and it'll throw you out of the seat at every opportunity, even (at speed) on gentle undulations on dual carriageways...I did exactly that in error and it was terrible, to me anyway..